Propane gas bottles are available in a range of sizes. Ideal for BBQing, commercial catering and caravanning. Whether you are looking for a new gas bottle, or want to make an exchange, we have the right bottle for you. Calor Butane gas bottles are available in a range of sizes and whether you’re a new customer or looking for an exchange, our Butane gas bottles are perfect for all of your camping, caravanning and portable heating needs. Calor Patio gas is perfect for fuelling BBQs and patio heaters and comes with the innovative Gas Trac indicator. Delivered to your door by your local Calor stockist, whatever your needs, we’ll have the right gas bottle for you. Accessories for Bottled Gas through to state of the art BBQs. We offer a one stop shop for all your gas bottle and appliance needs. 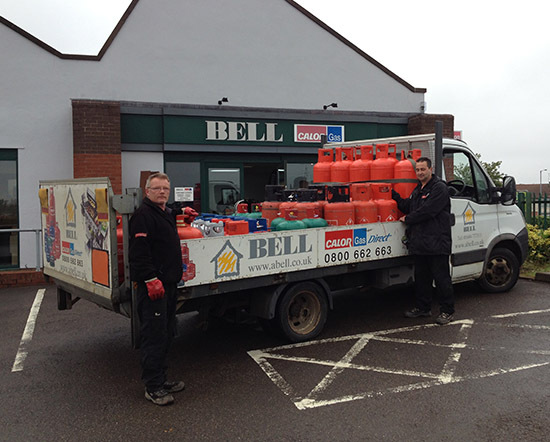 Here at Bell we’re proud of going that little bit further for our customers and ensuring we meet all of our customers individual and bulk LPG and gas bottle delivery needs. You’ll never have to worry about running out of gas again. Your delivery will be hand delivered by one of our dedicated Bell delivery drivers and if we need to go that extra mile or flight of stairs, please don’t hesitate to ask. We’re always happy to help! Delivery timings may differ during exceptionally busy periods, but we will always aim to keep you informed and welcome working with you closely to ensure you are happy with the service. See below for advice about where you can use LPG and LPG heaters. We stock a comprehensive range of gases including Camping Gaz, propane, butane, and barbecue and patio gases. 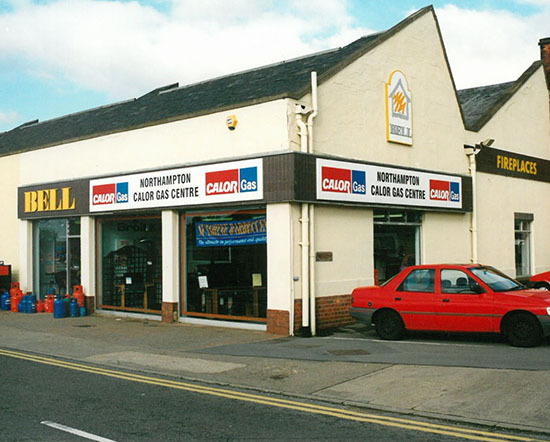 A.Bell is a main dealer for Calor Gas in Northamptonshire. We take regular deliveries from Calor and keep extensive stock to meet all your requirements for leisure and commercial gases, including supply for fork lift trucks. In addition, we carry a full range of accessories, including regulators, barbecue tools and disposable cartridges, and have specialist trained staff on hand to give you all the help and advice you need. 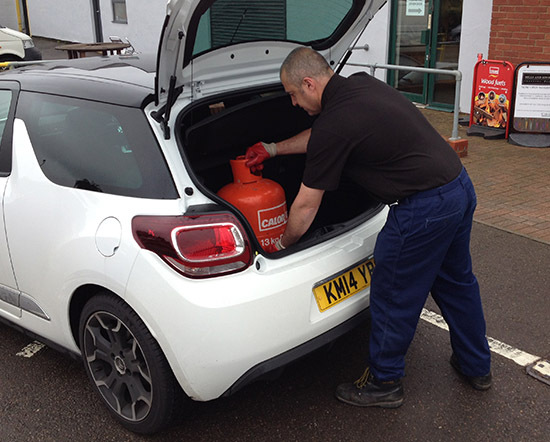 We offer a countywide, prompt delivery service for single and multiple gas cylinder orders. Alternatively, we have ample car parking for collections. Bell as a business in Kingsthorpe Road, Northampton is one of the oldest privately owned retailers in the county, having been in the town since 1898 when the first shop was opened at the top of Gold Street. Our aim has always been to provide great service and provide quality information to ensure our customers needs are met. 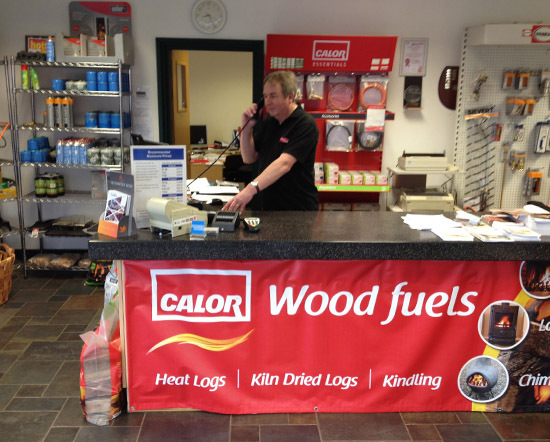 We are proud of our links with Calor and have been trading since 1956. With a strong relationship with local trades and businesses, we are able to provide a one stop shop service for all your Calor needs. Here at Bell our aim is to keep everything as simple as we can for our customers. Minimising the amount of paperwork and legalities. However, there are a few processes which need formalising, one of which is cylinder refills and returns. When you buy a gas cylinder from us, you’ll be asked to sign a copy of the Calor Cylinder Refill Agreement. Please spend a few minutes familiarising yourself with it to make sure that you understand exactly what the agreement covers and that you’re happy with the terms. This agreement is there for safty and to ensure you can simply return the empty one in good condition and exchange for a full bottle. If you have no further need for the cylinder simply return to us and receive a partial refund on the cost of the refill agreement. This is based on a sliding scale, dependant on length of time the agreement has been in effect. If you have any queries about our cylinder refill and exchange policy, please dont hesitate to contact us and one of our customer services team will be able to help, call on 01604 777500. Portable heaters are a winter essential for many homes, providing an economical and reliable source of heat for the whole family. Although these gas heaters are perfectly safe to use, you should always consider the positioning of the heater in your home, ensuring that it is located away from any potential fire hazards. The key to positioning your portable gas heater safely is to choose a spacious and well-ventilated room. Any furniture, curtains or other combustible materials should be arranged at least 1 metre away from the heater to prevent the risk of any items overheating and causing a fire. Many people choose to use their portable gas heater in their living rooms as this is where they spend most of their time at home and can benefit most from the heat provided. This is also often the most suitable room for use; providing the appliance with the space and oxygen levels it needs to function correctly. For some, the thought of using a portable gas heater in their garage or garden shed can be appealing, particularly if they are spending time working in these chilly locations. However, with various flammable materials being commonly stored here, it is vital to never use a portable gas heater in these areas. Warming your bathroom or shower room during the colder months can be an attractive thought, but we recommend against the use of a portable gas heater in these rooms. This is due to their size, which is often too small to offer sufficient ventilation for a gas appliance. Although tempting, never position your portable gas heater in any bedrooms in your home, as there is often an abundance of readily-combustible material in these rooms. This includes bedclothes and coverings, curtains, and soft toys; all of which could be at risk of becoming a fire hazard when placed near a portable gas heater. LPG cylinders should not be used under any circumstances in high rise unstrengthened large panel system built flats. Mobile heaters may only be used in flats of traditional construction with up to four storeys including any basement storey. If you live in a high rise flat of traditional construction above four storeys tall, you must not use portable gas heaters. Many tenancy agreements for these types of property will forbid their use for this reason. As LPG vapour is heavier than air any leakage would accumulate in the basement or cellar and would have no means of dispersing. As a result, the storage of LPG cylinders or the usage of LPG appliances in a basement or cellar is not allowed.